Our time in Durham is winding down; we leave on Saturday. Sorry for another anachronistic photo post. 1. 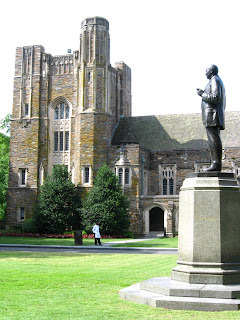 Statue on Duke's campus. I think it's Greg Paulus. Life is normal and exciting. We spend a lot of time at 1406 and are trying to get into a good rhythm of breakfast, pool/park, lunch, nap, park/play, dinner, grandpa/daddy time, bed. Kyle and my Dad carpool over to Duke most days and are there usually 8:30 - 5. We miss our Waco friends already. Jack is charming everyone. Lillian calls her aunts and uncles by their first names only. The pictures are out of order. First we have Lillian and Aunt Rachel, who is celebrating a b-day today. Then we have Lillian by a stream in Montreat, NC. Finally, Jack takes a break at a rest stop in Alabama.